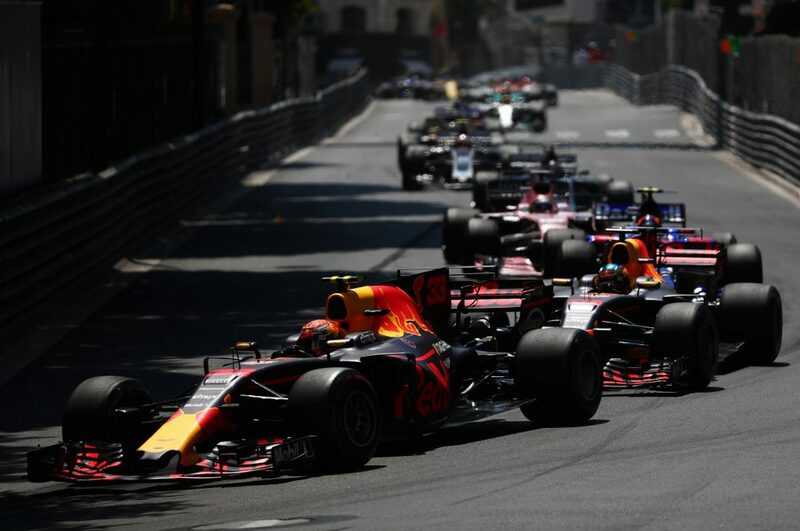 Monaco GP F1 Strategy Report Podcast – our host Michael Lamonato is joined by Matt Clayton, Australian Motorsport Editor, RedBull.com. The 2017 Monaco Grand Prix was far from a thriller, but with the new breed of Formula 1 cars, was that really much of a surprise? Kimi Raikkonen lined up on pole position but it was Sebastien Vettel who claimed victory, extending his championship lead over Lewis Hamilton to 25 points. Hamilton’s recovery to seventh place came after a disappointing qualifying session, where traffic and yellow flags saw him eliminated in Q2. He was starting from the best place on the grid after a stunning qualifying lap, but Raikkonen wasn’t quite so happy (let’s be honest, when’s he ever that smiley?) after the Monaco GP. Qualifying is even more crucial around the streets of Monte Carlo and with a strong start, the battle for the win came down to the pitstops. Some have suggested Ferrari directly favoured Vettel by giving him a stronger strategy, in order to maximise track position. Of course, this was denied, but the Raikkonen pitstop call doesn’t make a whole lot of sense really – maybe it’s just another one of Ferrari’s occasional strategy errors. Raikkonen pitted just after Max Verstappen and Valtteri Bottas, who were both doing solid but not spectacular sector times on super-softs. Ferrari must’ve known traffic could play its part too, but still stopped Raikkonen. It wasn’t a super-quick pitstop, so maybe they just missed the window they wanted, but it still cost him time and (most importantly) track position. His pace was comparable – but not quite so as consistent – as Vettel’s, but when he realised he was behind him, he backed off. Definitely a missed opportunity and no wonder he was even more downbeat than usual afterwards. Keeping in touch with Raikkonen through the first stint put Vettel in a strong position, with the ‘overcut’ working much better than many expected. The ultra-soft had very little degradation and around a seven tenth advantage, so it was surely going to be the best tyre to be on. Vettel stayed out five laps longer than Raikkonen and pitted on lap 39. He picked up his pace with some impressive in-laps, which were traffic-free (as Raikkonen was caught up behind some slower cars), and a good stop meant he emerged clear of his team-mate in first place. 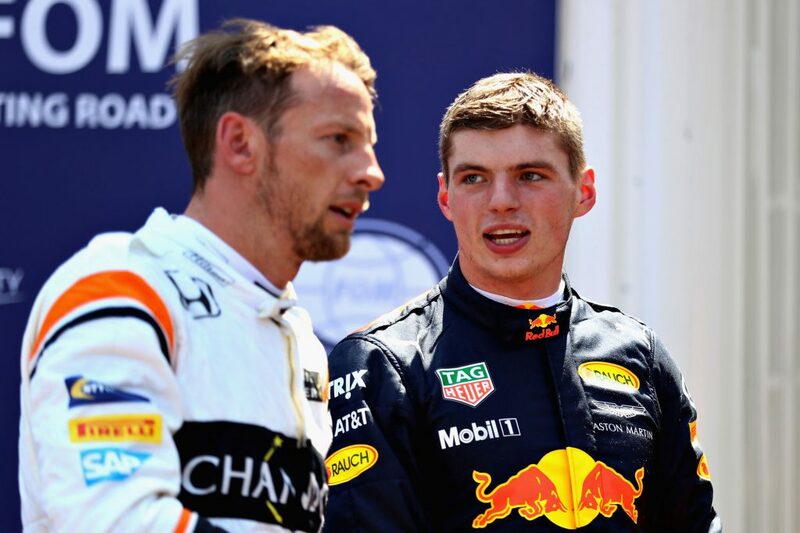 What made things even worse for Verstappen was than he not only lost a place to Ricciardo, but he also dropped behind Bottas too. This was after Mercedes aced the in-lap and pitstop for Bottas, who pitted one lap earlier and did a nice out-lap as well. The ‘undercut’ worked well for Bottas and this cost Verstappen. Had he done something similar to Ricciardo, it might have been a very different result. In the end, though, he stopped for a second time at the safety car. As mentioned earlier, surely a smart move was to stay out as long as possible on the incredible durable but quick ultra-soft tyre. 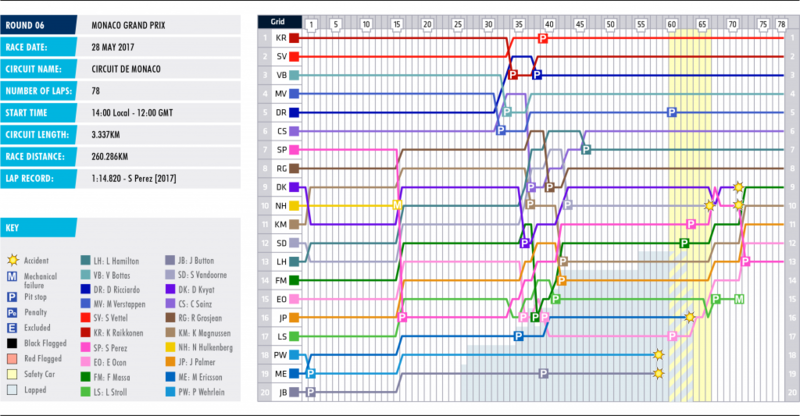 That’s what Hamilton did and it worked very well, he used the Mercedes W08’s strong pace (not shown in Q2) and the ultra-soft to move up the order as others pitted. Then, when he decided to stop on lap 46, from sixth place, he only lost one position. The strategy played out very well in getting Hamilton up the order, helped by a few incidents and drivers getting caught in battles, which cost them time in the process. Maximum damage limitation for the three-time champion with a ‘super-overcut’, you could call it. Stoffel Vandoorne looked on course for a point in 10th place after doing the same as Hamilton and staying out for a long opening ultra-soft stint, pitting on lap 43. It looked to have worked as he gained a few spots but crashing out just after the restart put pay to his race. A number of drivers should really have scored better results had it not been for unscheduled trips to the pits. Sergio Perez ditched his ultra-softs fairly early for super-softs (in part due to a front wing change) and this dropped him down to P16, which put him in slower traffic. A point may have been possible without a “PlayStation” move on Daniil Kvyat which required another stop for repairs. His team-mate Esteban Ocon’s impressive run of top 10 results came to an end due to a puncture, which denied him a possible point as he had to stop for a second time – which was no-one’s plan, really. Kevin Magnussen also picked up a puncture, which prevented him from beating his team-mate Romain Grosjean. Monaco’s low-grip track surface really is unique, presenting a completely different set of conditions. 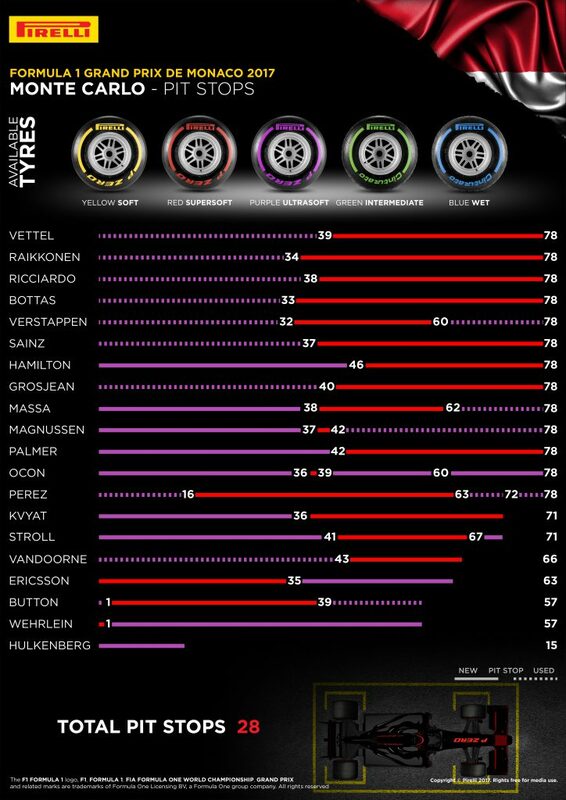 Pirelli took the three softest compounds to Monaco but even the ultra-soft had barely any degradation or wear, the tyre manufacturer admitting it could probably last the entire race. 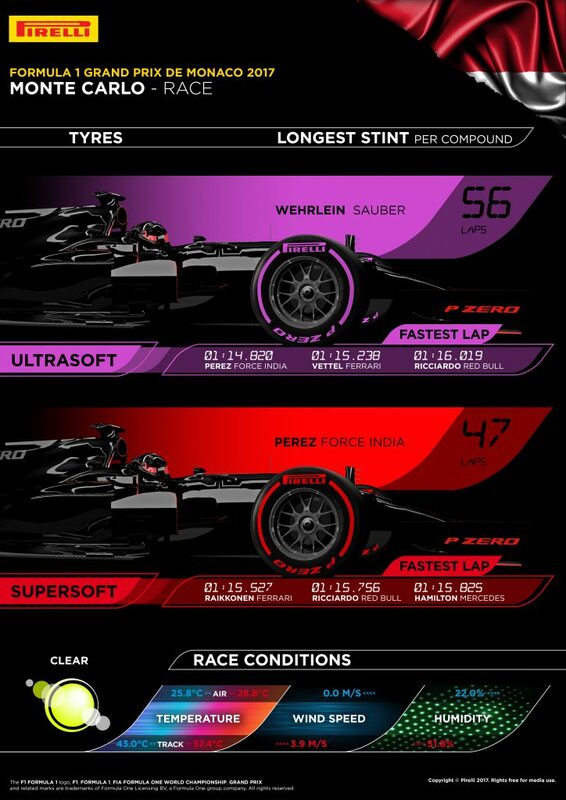 Pascal Wehrlein did the most ultra-soft laps with 56 before he was pitched into the barrier, his Sauber on its side, by Jenson Button at Portier. Perez did the most super-soft laps with 47, while the soft wasn’t used in the race and barely made an appearance all weekend. This meant a one-stop was always going to be the only strategy call.